You have a choice as to what kind of Birthday Party you would like to host @ Gymboree Play & Music! Your private Gymboree party lasts for 1,5 hours and includes a Gymboree teacher/party host, a special 45-minute Gymboree class, party decorations and supplies, refreshments, free play and a gift for the birthday boy/girl. Gymboree supplies the following: Gymbo themed invitations, plates, cups, utensils, napkins, balloons and drinks. You are welcome to bring your own food and cake if you wish. The cost of the Gymboree Birthday Party is €230 (for Gymboree members) or €275 (for non-members) for 12 children including the birthday boy/girl. 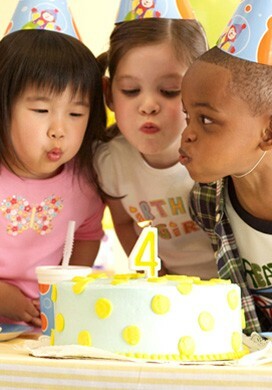 Should you wish to have more children (to a party maximum of 20), an additional cost of €15 per child will be payable. If you would like to extend your party, on a Sunday, this must be arranged in advance of the party and the additional half hour costs €50. A non-refundable deposit of €75 is due when submitting the party application. Upon receipt of the application and deposit, your party date will be confirmed. The remaining balance is due on the day of your party. All children, under the age of 3, attending the party must be accompanied by an adult. This is our opportunity to make your child’s party special. Please let us know if you have any special requests. Parties can be hosted on a Saturday or on a Sunday from 14:00 to 15:30. Click HERE for the Birthday Party Application Form. Fill it in and email it through to us.